Women’s MMA pioneer Roxanne Modafferi will return to the cage September 6th at Invicta FC 8, when she squares off against fellow veteran Tara Larosa in a featured Flyweight bout. In the rubber match of MMA’s friendliest rivalry, “The Happy Warrior” will look to establish herself as force to be reckoned with in Invicta’s 125lb division. Corey Smith: Initially entering into the world of martial arts via Taekwondo as a teenager, you then transitioned into various other disciplines. What was it that drew you to martial arts? What kept your interest after your initial entry? Roxanne Modafferi: I first started martial arts because I thought it looked cool. My passion for it grew, and I wanted to try as many disciplines as I could, and get stronger. Then I developed a love for Judo and jiu-jitsu as a sport, and wanted to try to compete on a higher and higher level. CS: After majoring in Japanese, you naturally moved to Japan where you had a storied overseas career. How would you describe the main differences between the American and Japanese MMA communities? RM: When I first moved to Japan, I felt like the Japanese accepted MMA and martial arts as a way of life more publically, where as in the USA people always gave the “Oh, don’t kung-fu me!” *fake fear* attitude. Eight years later, UFC Is on regular TV and I’m respected as a professional athlete. CS: Your nickname, the “Happy Warrior,” seems to apply to you both inside and outside the cage. Where does that aspect of your personality originate? RM: I always try and see the positive side of all situations. I’m generally a happy person, and I let it show. CS: As one of the original pioneers of WMMA, what advice would you give to an up and coming athlete in the sport? RM: Find a coach and a gym that will believe in you, and make an effort to help you grow. Listen to their advice. Be prepared to make sacrifices, either with your social life or working a crappy job to train, but always have a back-up plan in case something goes wrong with your career, like injury. Get an education if possible. Be passionate, but smart. CS: You returned to the United States to participate in the first season of The Ultimate Fighter to feature female athletes. What was that experience like for you? RM: It was a fantastic, eye-opening experience, showing me all the possibilities of what I could be. I grew so much as a person and athlete. 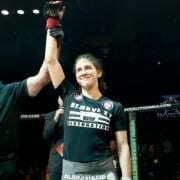 CS: You recently signed with Invicta FC. What has your experience been like with the company? What are your goals with Invicta? RM: My goals are to win fights. CS: On September 6th at Invicta FC 8, you will complete a trilogy with fellow veteran Tara Larosa. You each own a win over the other. What are you expecting out of the bout? RM: It will be a hard back-and-forth battle. She is strong and talented, and I’ve improved so much since I last fought. I can’t wait to show the world what I’ve been doing at Syndicate MMA Fight Gym for the past year. RM: I watch fighting anime if I’m at home. I take walks if I’m at a hotel. I like to fantasize how awesome my life will be after I win. I visualize the fight a lot. RM: I used to not watch it too much when I was in Japan, because I didn’t have time. I worked, trained, and slept. People don’t have house parties to watch fights in Japan because people’s houses are so small it’s hard to entertain. Nowadays, I’m living in the US and I go over my coach’s house with the team a few times a month and watch fights. It’s awesome. RM: I watch Japanese anime and wrote blogs. I always take walks after meals and listen to music. RM: First, I’d like to thank the head coach at the gym John Wood, for his great instruction, and assistant coaches Mike Pyle, John Gunderson, Vinny Magalhaes and Casey Milliken. RM: Thanks to my team, training partners, and manager Shu. Thanks to my current sponsors Herbal Papaya and Intimidation Clothing. RM: And a special thanks to my wonderful loyal fans and friends, who send me love, support and socks. I have the best fans ever! RM: A very special thanks to my mother who moved from Massachusetts to Las Vegas to be with me, support me, pay for my yoga studio membership and the rent, and bake me healthy banana bread.